People think they want new corporate headquarters and the jobs, benefits and tax revenues they bring. Until they begin to realize that increased traffic congestion, rising housing prices and cost of living increases are part of the bargain. And then, as the company - or industry gets defensive - everyone begins to wonder whether it was all worth it. Microsoft went through this 30 years ago in Seattle - and moved to the suburbs - which was seen as a retreat, but may now be regarded as a prescient move. Despite the millions that flowed to local governments in the Seattle area from Amazon, that money isn’t believed to be enough to pay for all the problems the company’s growth caused. (Seattle) took the prosperity the company brought and came to view it as part of its due. But Amazon turned out to be a bit of a closed shop. People found that if they didn’t code, an Amazon job was as unsplashily paid as any other. And the cost of living went up a lot, fast. It’s been nearly two months since Amazon served notice that it’s ending its exclusive relationship with Seattle and looking to see other cities on the side. Since then, the mega-retailer has received 238 bids for HQ2, its proposed second headquarters. These are places that are volunteering to pick up where Seattle left off, becoming a “full equal” with a headcount of 50,000 jobs, many of them superbly well-paid. These events have caused the following reactions in Seattle: Pick one! Good! Now my rent will stop going up. All of the above except b. Answer e is correct—with an emphasis on panic in government. Specifically, the counties surrounding Seattle ran after Amazon like obsessed teenagers. They made their own bids for HQ2—this one and this one. And why? Because local governments needed the tax dollars that Amazon fed into city, county, and state coffers. This region has some expensive problems, including astronomical rents and home prices, crippling traffic, the displacement of people of color, and spiking homelessness. Greater Seattle needed to keep the Amazon boom going, to buy time to address the long-festering problems that boom had exacerbated. That was a moment of genuine insight. Exactly how much tax Amazon pays to local governments is a state secret, known to only a few. 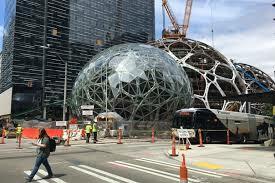 But now we know that, despite the millions that have flowed to local governments in the Seattle area from Amazon, that money isn’t believed to be enough to pay for all the problems the company’s growth caused. Constantine is saying Seattle will need much more of it if we want a chance to solve our housing shortage and public transit crisis. And that’s not happening: Since a senior Amazon executive told a tech conference that the Seattle region had a snowball’s chance in hell of winning HQ2, we’re going to have to admit that it’s really time to wean ourselves off our Amazon addiction. Was there ever anything we could have done to save the relationship and remain HQ1 and Only? I turned to the internet to find the signs we should have known our relationship was in trouble. In a relationship, you’re not supposed to keep score. You’re supposed to let the little points of friction go, in favor of the greater good of the relationship. That stopped happening in Seattle. It was about four years ago that I heard my first “Amazon employees are getting all the houses” story. It came from a businessman whose sunny disposition is famous around town. And wow, was he bitter. Amazonians starting hearing those things too. They got their own version of the Seattle Freeze—that cold social shoulder Seattle gives to newcomers. But this was out-and-out talking smack, in coffee shops, at parties, and in the media. It didn’t seem fair to people like Dave Niekerk, a former Amazon executive who was responsible for hiring during the dark days of the Great Recession. Back in 2008, local tech companies like Microsoft were laying people off; Niekerk’s company was hiring in droves, pulling Seattle out of its jobs slump ahead of other places in the country and saving the local economy. Amazon may be one of the most powerful companies on the planet, with the will and capacity to eat everyone else’s lunch. But at home, it gets no respect—Amazon finds itself blamed for all the city’s problems. Communication is everything in a healthy relationship—good eye contact, total honesty. In Seattle, all that has been getting weird with Amazon. The company’s lobbying budget is formidable: The company spent $6.2 million on sweet-talking local and federal lawmakers in the first two quarters of the year, more than Exxon or Walmart. In Seattle, some of that money went to a political action committee bent on putting “business friendly” candidates in positions of power locally. Few people know what that means, exactly, and when you ask Amazon its spokesman demurs. But we do know a few names. King County’s Constantine, who led his county’s futile bid for HQ2, is one of the favored. And the interim mayor of Seattle, Tim Burgess, who is opposing a new business tax that would be levied per employee (hello, fast-hiring Amazon! ), is a surprise donor to the same fund Amazon supports. It’s hard to understand what a company really wants when it might be throwing its own voice. And around here, that’s unfamiliar. When Boeing Commercial Airplanes, one of the Seattle’s other giant employers, wants something like tax breaks in exchange for existing jobs, it’s very upfront about it: The company makes demands; we pay; it’s over. In a healthy relationship, no subjects would be off-limits. But when Seattle tries to raise the topic of new taxes for the region’s many growth-related problems, we get the silent treatment from Amazon. Seattle city council talked about a tax on foreign homebuyers, which has gone nowhere to date. Then levying a fee on high earners was proposed. The chant “tax the rich” was heard in the council chamber. That measure passed. It easily might not happen (Washington State courts have a history of ruling income taxes illegal), but Amazon seemed to get the message: Within weeks of the council’s vote to tax the rich, the company launched the search for HQ2. Nonetheless, there are things we’ve managed to hold back from saying to Amazon. And do we get credit? No. So here they are. 1) Are the free bananas you give away in your Community Banana Stands supposed to be your idea of a clever joke? 3) If Washington State had an income tax to begin with, would you even be here? It’s good when people in a relationship give each other the space to change and grow. Seattle and Amazon, however, got stuck in a pattern. We took the prosperity the company brought and came to view it as part of our due. But Amazon turned out to be a bit of a closed shop. People found that if they didn’t code, an Amazon job was often as unsplashily paid as any other. And the cost of living went up a lot, fast. Seattle just sort of hung around, waiting for something to happen that would change the pattern. Then Amazon absolutely changed the pattern. And we didn’t see it. Amazon got to a point when it looked around and didn’t like what it saw. Maybe it lost faith it could recruit another 50,000 workers and fit them into this city on a suitable timeline. Maybe it just wanted the love and respect it believed it had earned from Seattle. We’ll likely never know, and now it’s too late. The company is executing its own plans to start a new relationship with another city, whose identity will be known sometime next year. When that’s decided, that’s when the dark days for Seattle will begin. New questions will arise: If this is just the beginning of a long goodbye, when will we know? How do we solve the problems we face and get the old Seattle mojo back? And if Constantine is right, and we actually do need more growth in order to fix Seattle’s growth problems—where will we get it? Can this town incubate another mega-employer? On this front, Seattle has been lucky in the past—airplane billionaires were succeeded by tech billionaires. But past results don’t predict future returns.